He looks so cute! 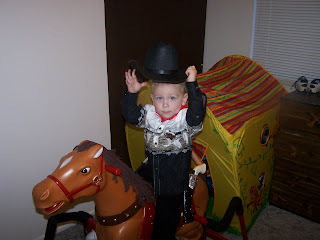 we dressed Harrisen as a cowboy for his first real Halloween too. 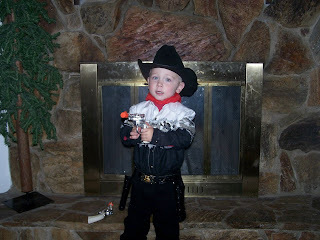 Dont they look cute in the wranglers and boots at that age. Shon, he is so cute! 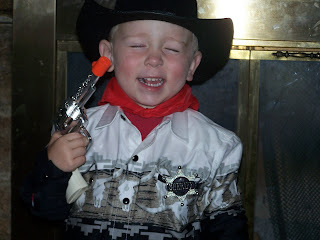 I was just looking over my Halloween pictures and I had to chuckle at all the pictures I have of Colter because he is always looking away or moving so the pictures are blurry. He is so like Ethan, never holding still. Oh and I love your new header picture. It is very very cute! What a cutie. How old is he now? What a little man! I love it! Wranglers and boots look hot at any age..right? !